I caught up with the laundry, paid some bills and enjoyed a Sunday morning while listening to Alec Baldwin's latest edition of Here's The Thing. The guest is is Roz Chast, who's been drawing cartoons of neurotics, cats and the stuff we leave around the house (and much else) for the New Yorker since 1978. It's a great conversation. This entry from someecards resonated, if only because I've been subscribing for several years (and occasionally listen live) to KCRW and their podcasts. The California station is dedicated to new music, and it has great ears; and, yes, it's true that you'll hear a tune long before it becomes a hit. But I also know that it can be really irritating to whine about having like a song before, well, everyone else did. Which is why this entry in the Willy Wonka meme also rings true! For more than a year, I've been listening to The Archers, which has been running on BBC radio for, oh, about 60 times as long. I subscribe to the show in a podcast, and although I rarely keep up with it on the near-daily schedule (it comes on six times a week) I keep up by listening to the show in batches. (Three episodes equals one walk to work, with room for a tune or two.) Yes, you can call it a soap opera; and yes, the daily 13-minute instalments of life in a village somewhere in the Midlands is habit-forming. One of the recent themes is the future of the village pub, The Bull, where owner Jolene is still not over the sudden death of her man. The T-shirt above, which is actually for sale at Archers Addicts, mirrors precisely what characters wore to rally around the pub, with the storyline echoing the very real threats facing small-town pubs. Case No. 1. It happened in one of the splashier restaurants in St. John’s, and we were out for dinner with one of our favourite couples. Several tables over, a cellphone started ringing. And ringing. And, minutes later, ringing yet again. We suspect the well-heeled folks at that centrally located table were pretty significant, because the wait staff and managers at the restaurant did not ask them to turn off or even mute the phone – which, incidentally, was never answered – despite several requests (including from our table) to do just that. Case No. 2. Recently I watched a table of four thirtysomethings wait for their dinner, all while they individually checked their phones, sent messages, browsed, Tweeted or whatever it was they were doing. It made for quite a sight – a quartet of bobbing heads and fixed gazes. Obviously, the first case was more annoying, both because of the noise and the restaurant’s refusal to address the loud elephant in the room. But, more and more, Case No. 2 is becoming more of a nuisance, even as the phenomenon – a full table of adults all consumed with their smartphones – becomes more prevalent, and even though they don’t actually make any noise. Maybe it’s because it’s so distracting; I can’t help but notice all those turned-down heads and the flicking and clicking of fingers and thumbs. Or maybe because it’s so sad. Yes, a tricked-out, app-heavy phone can be amazing, but the time and place for it surely is not a night out in a restaurant with friends or loved ones. After all, if the mobile web, like the desktop web before it, is all about connection, why turn your back – or your forehead – on one of the most wonderful ways to connect? What, really, is a meal but a chance to share and to delve deeply into the lives and thoughts of people who matter to us? I haven’t been tempted, of course, to complain about a table of phone-addled customers. For their sake, maybe some day I will. If you were at MUN in the early 1980s, the name Captain Leisure may mean something to you. It was a comic strip that appeared in the Muse, the student paper, and it was the creation of my friend Tim Peckham. Tim has gone to be a graphic artist and cartoonist in Toronto, and is now the creator of an app at the iTunes store. Loading TimWit will give you 200 editions of a single-panel strip Tim created. It’s a great chuckle, and it’s free. ROAR, as it’s also known, bills itself as Newfoundland’s first podcast … which sounds about right to me. It’s a product from singer and musician Jim Fidler, and it’s back on track after being a little dormant for a while. Click here to subscribe and have new editions delivered straight to your drive. Years ago, I had the opportunity to see the Sistine Chapel for myself, and although one of the highlights – Michelangelo’s full-wall fresco, The Final Judgment – was not then visible because of restoration, I found the experience almost overwhelming. This panoramic view of the Sistine Chapel is provided through the Vatican’s website; it’s not as engaging as the real thing, but it’s still pretty absorbing. Need proof? Just try the zoom function, and see the stunning detail of Michelangelo’s work. Finally, I leave for you a bit of wisdom and common sense. What is it, you ask? Well, you’ll have to find out for yourself. I've worked with some creative and talented people over the years, but no one is quite in the league of Chris Brookes. For decades, Chris has been making radio documentaries that are among the finest in the world. The documentary aired on RTE, the Irish broadcaster, last fall. You can listen to the full piece here. Since then, Jack Wells suffered a great loss, when his iconic twine store was battered during a recent storm surge. This site is raising money to help; click here to find out what you can do. In the meantime, take some time to visit Chris's Battery Radio site. He's a local treasure ... and a national one, to boot. Our lives are made of serious moments and foolish thoughts, of solemn reading and outright silliness. This point really came to home when I took note of some of my recent surfing habits. The world hears much about Doctors Without Borders (aka, Medecins sans frontieres) when there are natural disasters, such as last month’s earthquake in Haiti, although the organization is active year-round, around the world. Voices From the Field is a collection of reports that add important perspectives to stories that have been reported, but not necessarily understood. I like Dwell magazine, which I learned about years ago from the architect in our family. I’ve bought many copies since then, even though we’re not planning to build one of those ultra-cool houses from scratch with reclaimed or industrial materials … the sort that magazine art directors plan photo shoots over. What I had not noticed, though, until I saw the Unhappy Hipsters site is how often the subjects have grim (or at least bored) expressions on their faces. It’s been years since Memorial University ran the renowned Extension Service, but it still reaches into the community with non-credit courses on a wide range of topics, from art to business skills to all sorts of recreational pursuits. Talk shows cover the gamut of issues, from the day’s news to celebrity foibles. Here’s one with a twist: a talk show dedicated to wine, and nothing else. A new audio podcast goes out about every week, sometimes replaced by a video feature. It’s about far more than wine tastings: you’ll hear about urban wineries, how restaurants go about putting together great wine lists, and the science of winemaking. It’s fascinating, and terrific listening for, say, making a Saturday supper while sipping on a nice glass. Amid the countless sites pitching ways you can spend money and buy more, the site mnmlist (that’s a minimal way of saying “minimalist”) takes things in exactly the opposite direction. In other words, that means decluttering and simplifying your life, and especially doing away with many of your possessions. Sure, reducing your carbon footprint, etc. etc., is noble, and many people will find inspiration in the posts here, but I found that even a few minutes here was about as much piety, earnestness and self-admiration as I could digest. If it’s freezing cold out there – really freezing, so cold you’d need to find warmth in the carcass of a peculiar creature – you could say it’s just like Hoth. Hot and cloudy? Yavin 4 comes to mind. This is a fun site that will appeal to Star Wars fans, even though it’s a one-note joke. Theoretically, you can enter any city’s name and get a matching forecast, though I couldn’t get far with anything for St. John’s. Often foul-mouthed reviews, and presented in just a few words. Here’s an example of the kids’ animated movie, Barnyard: “Hate your kids? Show them this.” Ouch. As you might guess, be prepared for swear words and strong language. Here’s a chuckle, and a novelty to pass to your friends – especially those who like to get you to look stuff up on their behalf. Whether or not you satisfy yourself by sending a link to them (on the hopes that they well and truly get the message), you’ll get a kick out of watching what happens when you type in a question. John Gushue is a writer in St. John's, and works with CBC News in St. John's. John is on Twitter right here. "Without music, life would be a mistake," said the most light-hearted man in history, a.k.a. Friedrich Nietzsche. This week, we have some help in finding some new fodder for the iPod. How devoted are Bruce Springsteen’s fans? Not just the ones who yell “Broooooce” at his concerts … anyone can do that. The fans who maintain this index, which consists of lovingly if not quite legally recorded concerts and such, are hard-core. You’ll find material dating back to the Seventies, when The Boss was just one of the New Dylans, and before people starting describing soulful rockers with something to say as New Springsteens. Have you ever championed an up-and-coming group so much that you’d bet on their success? Welcome to Slice the Pie, which actually lets you put your money where your mouth is. The prospects are generally unknowns, and the stakes are fairly small (the idea is that many hands can work together to help a band make it to the next level), but as games go, this one is far more rooted in reality than many virtual alternatives. I love finding music, and I like a good bargain, which makes free song-of-the-day features an attractive find. I recommend the long-running offers from the U.S. radio stations KEXP and KCRW; here’s another one, hosted by a Minnesota Pubic Radio program called The Current, specializing in the broad label that is alternative rock. Recent entries have included better-known bands like Spoon to up-and-comers, like the UK folk act Mumford & Sons. Last year, CBC Radio 2 painted itself red and white and asked its audience to pick the places in the country deserving to be commemorated in song, and the artists to do the tunes. The local winners were Gros Morne National Park and Hey Rosetta! (above) Here’s a link to a video of the resulting concert. Kick your feet up and enjoy. For almost a decade, Songfight has been a champion of grassroots, handmade, no-frills indie music. And, yes, getting fans to fight about it. The premise is simple: for each weekly voting period, bands or singers upload their own songs, and then the public votes on what they like. You can vote once each week, but you may actually vote for more than just one song. Indeed, you’re asked to vote for all the “good” stuff and ignore the bad. Even better, you can download what you like for free. It may be in poor taste, but I bet this site attracts plenty of visitors, curious to learn how various musicians met their fate. There’s not a lot of scholarship here (some entries appear to have just been copied and pasted from other sites), but some fascinating, if grim, reading. Last Friday, I recorded the debut episode of HBO's Ricky Gervais Show, and we caught it later on. It's fun, and it's strange; if you haven't heard, they've taken old podcasts that Gervais made over the years with his long-time collaborator Stephen Merchant and their comic foil, Karl Pilkington. The two-dimensional, jaunty animation style is like something right out of the Sixties (think the Jetsons or Flintstones), except that what you see is most definitely not for the kids. I've heard many of the original podcast episodes (the in-the-flesh chaps are above), and remembered some of the inane exchange between Pilkington and the others over everything from technology to human reproduction. Seeing the banter, including Pilkington's utterly daft ideas, come to life is something else. The year is down to its final hours, the champagne is chilled, and my calendar for 2010 is suspiciously filling up already. Before I get into the swing for what the coming year has in store, here are some markers of the year we’re putting behind us, with nods to the big trends and favourite moments of 2009. What we call the real-time web hit its stride in 2009, and is likely to evolve even further, and more powerfully, in 2010. The web has always operated in real time, of course; it’s just been difficult to know what’s happening, and being published and said, as it happens. Google has led the way with search results that emphasize the instantaneous. Twitter and its myriad spinoff applications have made the real-time web a hot item. And even on Facebook, millions of users have become accustomed to real-time connections; thanks to instantaneous notifications, two or 20 friends can have a rapid-fire running commentary on a photo, note or status update. The link above will take you to an iTunes page for a massive collection of classical music called 111 Years of Deutsche Grammophon, and I apologize if you think you’re about to get a deal. Unfortunately, this deal was a boo-boo, and it lasted for just a few days in October, when the package – 730 tracks of masterworks, or 55 CDs of music – was selling for just $9.99. Turns out the right price was $119.99; what a difference two digits make. We noticed some chatter on Facebook, and logged on straightaway. It took hours to download the lot, and not long after, iTunes corrected the price. That would be Tee Fury, which sells one-of-a-kind T-shirt designs for just US $9 … with the catch that each design is available for only 24 hours. I bought a Star Wars Christmas parody (an AT-AT walker done up as a reindeer, in a scene called Merry Hothmas) for everyone in the family. Augmented reality got a fair bit of attention in 2009, although AR is far, far from mainstream use. (Or real reality, as it were.) The idea is that we’ll be able to mash up devices and software with interactive applications, often with a GPS tossed in there somewhere. For instance, you one day will be able to point your phone at a restaurant and have its menu downloaded to you; tourists can have real-time information served up as they navigate their way through attractions and to destinations. Expect some deliverables in 2010. I subscribe to several dozen podcasts, which is, probably, a few dozen more than I need. I will probably spend some time this week doing mass-deletes of the 35 gigs I’ve accumulated. In the meantime, I never miss the Friday Night comedy podcast from the BBC, which makes the weekends a little funnier. Google Wave is very cool: I’ve read and been told that dozens of times. That said, I don’t use it. I can’t quite see how it would apply to my life yet. I’m not saying Google Wave, which allows teams to work together simultaneously on projects, sharing their documents and communications, is useless; far from it. I’m simply one of the people that can’t apply it. I’m curious to see how it and its sure-to-emerge competitors will evolve. A piece in the new issue of Vanity Fair argues that America has become addicted to cuteness, with endless websites devoted to panda bears, kittens and babies. Fair enough, but there’s a good reason why certain, exceptionally short videos (think of that baby kicking his legs in step while watching Beyoncé’s Single Ladies video, or the kitten that popped its paws out after being tickled) spread around like a tornado. Amid a chaotic day, everybody needs a smile. That’s all. Vanity Fair hosts a podcast called Writers Reading; the most recent sample is Jon Raymond, reading a story from a new collection called Livability. You can listen to it here. Last night, I missed out on Dale Jarvis reading some of his trademark stories at the Newman Wine Vaults in downtown St. John's; we had a barbecue invitation that kept us from going. Kudos to Dale, though, for posting some audio from the reading as a podcast on his blog. This particular story, the Lady at No. 16, involves a haunted house in Malta. You can stream the audio here; you can download it by clicking here, looking for the link, and right-clicking on it to save to your computer. Look there also for instructions on subscribing to his podcast. I wrapped up a couple of weeks as the morning news producer for CBC Radio here in St. John's; one of the duties of the job is putting together the weekly podcast, Newfoundland and Labrador This Week, which is released first thing every Saturday morning. Help yourself to it right here. Here's something that didn't happen over the last week: I didn't listen to any podcasts. Not a single one. That makes me utterly unremarkable, in that most people don't listen to any podcasts in any given week, either. Despite quite a bit of buzz, and an undeniable burst in the range and quality of podcasts available for download, many people go happily through their daily lives without ever encountering one. Here's my excuse. I was pretty damn busy last week, with a myriad of work projects, home demands and time constraints to juggle. Something had to give, and podcasts were one of them. I didn't even notice until the other night, when I checked out my directory in iTunes, and realized I hadn't listened to anything new in eight days. Not only that, but I've been letting stuff pile up for months anyway. Clearly, I have some pruning to do. I was surprised (but really shouldn't have been) to learn I was subscribing to 79 different podcasts, ranging from song-of-the-day services from radio stations here and abroad to newscasts to comedy bits to plugs for popular shows to mercurial programs obviously recorded in someone's living room. It's a snap to sign up for a new podcast. In fact, I all too obviously do it all the time. But just as I've had to be conscious about not letting the Inbox in my e-mail program turn into an outright mess, I've decided to let some podcasts go. As well, I've been deleting like crazy, and deciding to live with the consequences of never having heard that Irish documentary or all those great unsigned bands just looking for a break. I still keep signing up for new podcasts, just to try them out. This week alone, I signed up for two more. I've also reminded myself that the best way to keep up with this stuff is to move at least a few podcasts every day on my iPod; I'm much more likely to scan through new pieces while I'm walking or at work then when I'm at home. Here are a few resources you may want to consider. NPR offers a great, great variety of material from public radio stations across the U.S. - something for everyone, as it were. Poke around. I subscribe to the Most E-mailed Stories feature, some music podcasts, and a regular bit of cultural commentary called Martini Shot. Browse through the list, and sample away. 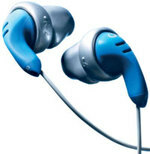 Buzz Out Loud beams every out weekday from the technology site CNET. It's introduced each time as the "podcast of indeterminate length," which is a nice way of saying that sometimes it runs a little long, sometimes a bit short. It's generally about a half hour, and if you follow tech news - from Apple's forthcoming iPhone to Dell's woes to makers and shakers in the field - this is a podcast worth signing up for. (I usually only listen to the first 10 minutes, anyway.) It helps that the hosts are breezy, conversational and often pretty funny. If you don't have time to listen, look for the Show Notes tab to keep up with the stories covered each day. Memorial University runs a podcast called Studio 1024, named after the room number where it's recorded. 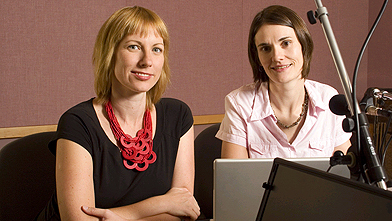 New programs won't pick up until September, but an archive is available of recent programming. John Gushue is a news writer for CBC.ca in St. John's. Site suggestions always welcome at surf at thetelegram.com. John is on Facebook right here. The weekly regional podcast from CBC Radio in Newfoundland and Labrador is out this morning - it drops early every Saturday - and this week has an interview with a sealer who (at that point) was ice-bound for 18 days. Terry LeDrew, my colleague from Corner Brook, handles the hosting this week; you'll also hear tape from the John Crosbie roast, climate change in Labrador, and much else. You can subscribe here. Elling Lien and the Scope have launched a podcast. The debut edition is about St. John's hip hop producer Hotbox (who's also a high school math teacher - there's a feature to be done there, news editors!). A sample tune is included, although it's not for younger ears. Elling says podcasts will be going out every two weeks. Details here. My colleague Jon Soper looks after the weekly podcast from CBC Radio in Newfoundland and Labrador; the latest one went out this morning. Features include material on the legislative spending scandal, and features on a work exodus from Burgeo, a troop of aboriginal drummers in Labrador who are fighting substance abuse, and a profile of a women's hockey team who show it's never too late to get in the game. Details on subscriptions here. 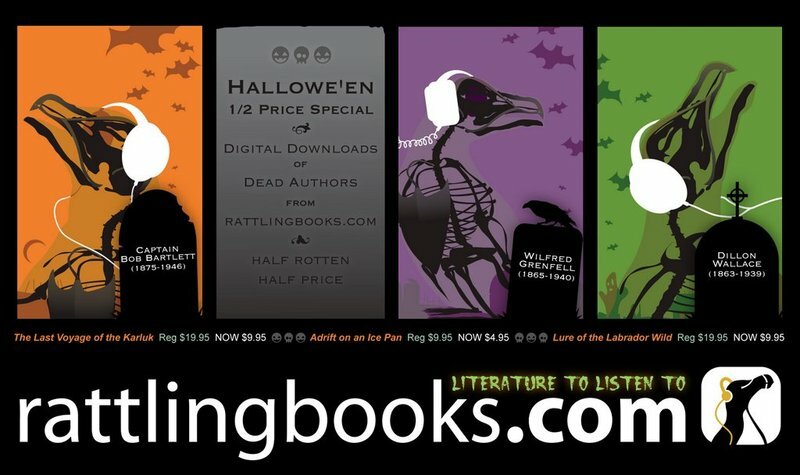 Rattling Books is getting in the Halloween spirit, so to speak, with a half-off discount and a tip o' the hat to some of the deceased authors whose works they carry ... specifically, Wilfred Grenfell, Dillon Wallace and Bob Bartlett. More here. Ricky Gervais' podcast was must listening early this winter, when London's Guardian newspaper sent it out into the ether, and millions of people downloaded it. A video podcast followed this summer. The third round is underway, but with a catch: this time, you gotta pay. More on Ricknomics can be read here. On Friday evening, I received the latest documentary podcast from the Irish broadcaster RTE. Titled The Orphans That Never Were, it's an excellent piece (first broadcast this winter) on a 1943 fire that killed 43 children in the Irish town of Cavan. It's about 40 minutes; you can stream the doc live here, and read more about it. Heartbreaking. I'm listening at the moment to the regular Ebert and Roeper podcast - basically, it's just the audio of the weekly TV series, and although they're discussing movies while the clips play over their voices, the lack of a visual element doesn't take away from anything. 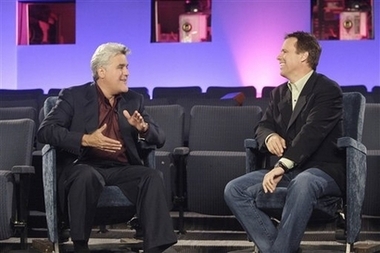 With Ebert recovering from cancer-related surgery, the producers recruited a celebrity fill-in: Jay Leno. Leno's range of critical thought doesn't seem too varied, but who would have expected that, anyway? Instead, he responds to the movies as a comedian, and also as a fan. Smirk alert: next week, the substitute will be Kevin Smith. 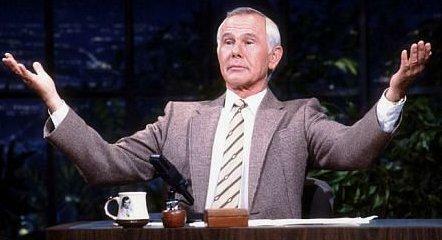 Johnny Carson is no longer with us, but his estate is keeping up with things. Click here to set yourself up for the Johnny Carson podcast, consisting of audio highlights from the Tonight Show, one of them being excerpts of Jerry Seinfeld's 1981 debut on the show. The book publishing business is one of small (tiny, really) margins, which makes publicity a tough nut to crack. HarperCollins is trying something this summer: a series of podcasts, featuring interviews with selected authors. The first, with Londonstani author Gautam Malkani (right), went out last week; I listened to Cathi Bond's 22-minute interview pretty closely yesterday, even though I was puttering around with some odd jobs. (Bond is doing the gig on behalf of the Four Sevens podcast network.) The objective with publicity is to help move product, and while I didn't whip out my credit card and order a copy, I'll definitely pick up one if I see it on the shelves at a local bookstore. Which raises the issue of distribution ... a whole other kettle of fish. Subscription info for Prosecast, as it's being called, is here.